Be careful, or you might run into this guy. 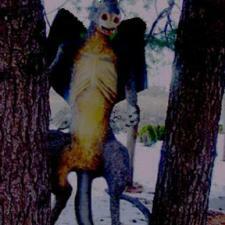 The Jersey Devil Expeditions is the movie diary of Fighting Owl Film's new independent monster movie of the same name. Over the course of the next several weeks and months, you'll get an insider's peek at what it's like for filmmakers to craft a new entry of paranormal pop culture from Erin Lilley, a producer and actress on the film. In our film, Jersey Devil Expeditions, a group of tourists, along with their guides from a local roadside attraction, set off on an overnight hunt for the Jersey Devil. They expected campfires and marshmallows, but ended up with a whole lot of trouble. In reality, these kinds of hunts really do exist! The Pinelands Preservation Alliance hosts Friday Night Jersey Devil Hunts, where brave souls (ages 10 and up) meet up for a mile and a half hike into the heart of the Pine Barrens. Before the adventure - just to make sure it's dark and scary enough - the hunters gather around the campfire for a sing-along and "BYOHD" (Bring Your Own Hot Dog) weenie roast. Throughout the hunt, an intrepid guide regales the group with tales of the Jersey Devil and other creatures that are rumored to roam the woods. As for spotting the Devil ... well, it's a distinct possibility! Obviously, this is a family-friendly, educational activity to support wildlife preservation in a fun way. If you find yourself in the Southampton area and would like more information, you can contact the PPA at (609) 859-8860 or check the PPA website. We're still searching for our own Jersey Devil, here at Fighting Owl Films. We're making headway, as far as fundraising is concerned, but, as with any creature hunt, it's a lot of hurry up and wait. There have been rustlings and fleeting glimpses, though. We're now working with a producer consultant to find investors, and have received some very positive feedback on the script. With a little luck, maybe we'll catch something on film soon.